The index case had a date of onset of symptoms on 17 May 2018 and by 31 May, seven symptomatic secondary cases were reported from this cluster. More cases are expected to be reported from this cluster as the close contacts are being followed up and the laboratory test result of some of the close contacts are awaiting. 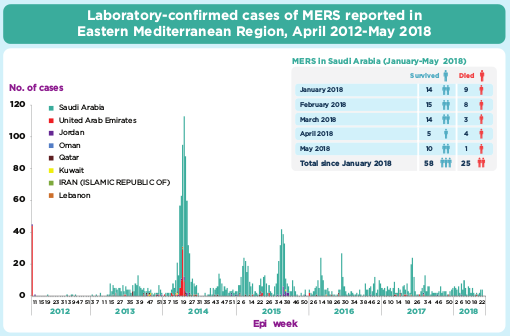 Although an interruption in MERS reporting anytime of the year is a concern, over the first five years of MERS tracking (2012-2017), just over half (52.73%) of the world's cases have been reported in the spring and early summer (April 1st - June 30th). Add in the fact that the start of the Hajj is now less than 6 weeks away - where several million (mostly international) religious pilgrims will visit the Holy sites in Saudi Arabia - and this is probably not the best time to lose visibility on the ground. 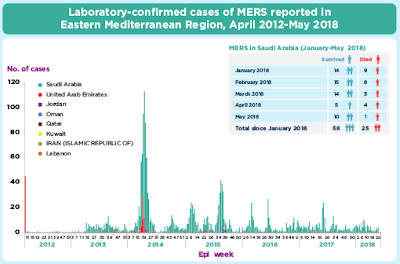 While the chart at the top of this blog shows obvious spikes in the spring and early summer - which are most apparent in 2014 and 2015 - we've a new study, appearing in the European Review for Medical and Pharmacological Sciences, which breaks down the seasonality of MERS-CoV both in the Middle East, and globally. OBJECTIVE: Middle East Respiratory Syndrome Coronavirus (MERS-CoV) is an evolving global health crisis. Despite recent efforts, there are numerous notable gaps in the understanding of MERS-CoV seasonal diversity. We aimed at investigating the global seasonal occurrence of Middle East Respiratory Syndrome coronavirus (MERS-CoV) outbreaks. MATERIALS AND METHODS: We obtained the data on the prevalence and occurrence of Middle East Respiratory Syndrome Coronavirus (MERS-CoV) infection from the World Health Organization (WHO) for all the MERS cases reported from the various countries and their allied ministries. We also recorded the research documents published in various global scientific journals on the seasonal occurrence of MERS-CoV infection during the period 2012-2017. RESULTS: Worldwide 2048 laboratory confirmed cases of MERS-CoV infection were reported from June 2012 to the Dec 2017. 1680 (82.03%) cases were from the Saudi Arabia and 368 (17.96%) cases were reported from the other countries of the world. The maximum number of cases reported in June was 474 (23.14%). 287 (14.01%) cases were reported from Saudi Arabia and remaining 187 (9.13%) cases were reported from all over the world. The number of cases reported from April to June was 396 (19.33%) while the cases encountered from October to December were 231 (11.27%). CONCLUSIONS: The highest global seasonal occurrence of Middle East Respiratory Syndrome coronavirus-MERS-CoV outbreak cases were found in the month of June, while the lowest was found in the month of January during the period of 2012 to 2017. 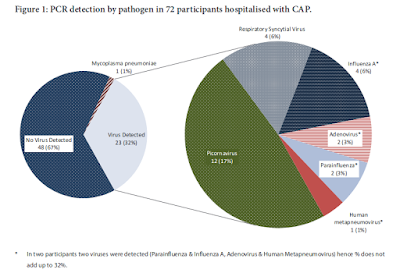 The pattern of MERS-CoV infections has been observed to have seasonal variations. It is suggested that the health officials should highlight the seasonal occurrence of MERS-CoV outbreak and take better preventive measures to minimize the disease burden nationally and globally. The full PDF can be downloaded at THIS LINK. Simply put, there has been a 10-fold difference in the number of MERS cases reported (between 2012-2017) in January (n= 47) and June (n=474). Other low activity months (see below) include July, November, and December. The spring surge in cases has been tentatively linked to the camel calving season (see EID Journal: MERS Coronavirus In A Saudi Dromedary Herd), but the reasons behind the dramatic drop in MERS cases in July - followed by a resurgence in August - is less apparent. One possibility is simply a reporting problem; perhaps decreased surveillance and/or reporting during the Holy month of Ramadan, which fell mostly during the month of July in 2013, 2014, and 2015 (side note: KSA stopped reporting MERS cases on their website on May 15th - the 1st day of Ramadan 2018). It may be due to climatic conditions (July is the hottest and driest month in KSA, although not all that different from August). Or perhaps by mid-summer the camel population has built up enough (temporary) herd immunity to reduce the level of zoonotic transmission (see MERS-CoV In Camels: The Gift That Keeps On Giving). Whatever the reason, surveillance for MERS-CoV - even in the best of times - is spotty at best. We've seen estimates that many - perhaps even most - MERS cases go undetected. In November of 2013, we looked at a study published in The Lancet Infectious Diseases, that estimated for every case identified, there are likely 5 to 10 that go undetected. In 2015, when Saudi Arabia had recorded fewer than 1200 MERS cases, a seroprevalence study (see Presence of Middle East respiratory syndrome coronavirus antibodies in Saudi Arabia: a nationwide, cross-sectional, serological study by Drosten & Memish et al.,) suggested nearly 45,000 might have been infected. And a 2016 study (see EID Journal: Estimation of Severe MERS Cases in the Middle East, 2012–2016) suggested that as much as 60% of severe Saudi MERS cases go undiagnosed. While a substantial number of MERS cases may be flying under the radar, and the patterns haven't been entirely consistent from year to year, the data we have suggests a double-peak to MERS seasonality with the largest occurring in the spring, and a second, smaller peak in the fall. Hopefully reporting of cases by KSA's MOH will resume before the start of this year's Hajj (Aug 19th - 24th) - which roughly corresponds to the `second peak' of cases which have been previously reported. As we discussed in ATS: Mass Gatherings And Lessons From The Hajj, while we haven't seen a serious outbreak of MERS associated with the Hajj, mass gathering events, like the Hajj, Ramadan, and the Olympics do appear to provide pathogens with unique opportunities to spread on a global scale. Which is why - probably through the end of September - public health agencies around the world are going to need to be on heightened alert for the possibility of seeing imported MERS cases.